One of the basic attributes of human nature is the need to “belong”. This has its roots in our evolutionary history. During the pre-evolution period, when our ancestors lived in Savannah, it was important to be a part of a group in order to survive the dangers. It has thus become a vital part of human needs. Even Maslow’s Hierarchy of Needs, which is a widely popular and accepted theory in psychology, supports this. It places our need for a sense of belonging and acceptance immediately after physiological and safety needs. 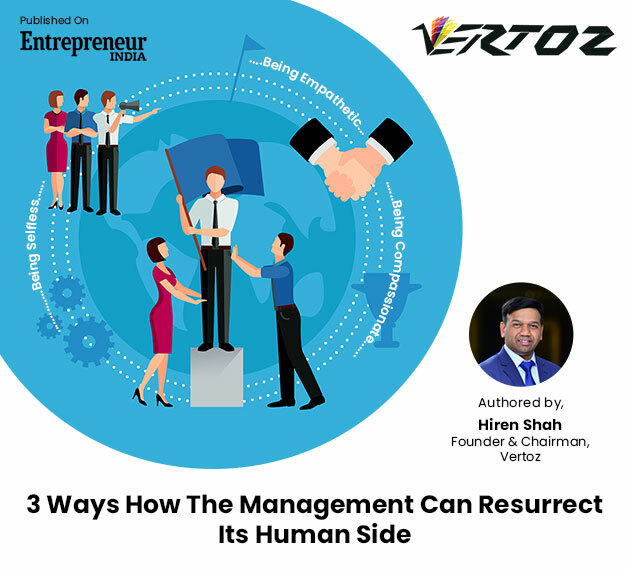 Vertoz Founder and Chairman, Hiren Shah, talks with Entrepreneur India, on how understanding this fundamental need and forming meaningful bonds with the team members helps one be a successful manager. He says that a leader who can create an intrinsic motivation among the team members by applying this understanding of human nature and build a strong team is considered as a successful leader. It is important that the employees get a feeling of happiness, belongingness, and connectedness at the workplace. Through this, their performance can be improved exponentially. It also creates loyalty and engagement within the team. In short, it is important for the management to resurrect its human side instead of being cold and stern. One major quality that the management needs to incorporate is Empathy. Empathy helps in improving performance. Many Silicon Valley giants have realized this, while one of them has even incorporated its own Empathy Lab for the benefit of its customers. This lab is meant to it give its product team an opportunity to “empathize” with their customers i.e. to get into their shoes and experience, firsthand, how the customers will use their product.